‘Tis the season of giving and receiving in many cultures, as we stretch beyond our wallets’ capacities to express our love and appreciation for family and close friends, with religious holidays being the impetus for this giving. I personally have great memories of the holiday season. Growing up Jewish, I enjoyed lighting the candles, eating latkes, and most importantly, opening presents. I honestly don’t remember ever asking for much in particular. I didn’t have to. My parents spoiled me rotten with presents for eight nights. I remember sneaking downstairs to the “hiding place” with my brother trying to guess what we were getting, usually unsuccessfully. My parents loved seeing how happy we would get opening gifts, the way children do. Nowadays gift giving isn’t quite the same. It’s hard to buy things for people when they are likely to just buy what they want, if they can, and if they can’t afford it, finding a way to save up and buy it for themselves. 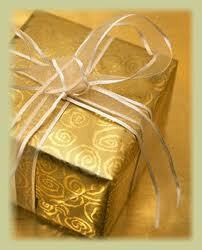 Gifts require a lot of thought for them to be worthwhile. You have to be able to think of something that the person would really like but wouldn’t buy for themselves. I personally really enjoy gifts that involve some kind of experience that I can share with the buyer, like a concert or a play. But with age comes awareness of budgets and tough times, and physical gifts can seem selfish when there are better things to wish for. I think back to where I was at this time last year. I was in a really tough place financially, but not as tough as I thought I was. Still, I freaked out and made things worse than they really were. All because of money, when there were real problems all around me. I’m happily in a better place now financially and appreciative of everything I have, but I do have a few things on my wish list this year. I wish for jobs for those who spent their whole life working only to lose it all. I wish for years of health for my family. It’s been a rough few years. I wish for continued happiness and growth in my love life. I wish for a better world for my future nephew. Nothing you can put a bow on, nothing you can buy in a store. I wish for positive change in my world and in the larger world. And yes, I’ll take that as a gift certificate. Well said. I think the gift thing is selfish at times and when I do give a gift it is best to give something where you can share with the person you are giving it to. That was really beautiful Dana. Love you very much and hope that the wishes come true. I second that, the recession has hit pretty hard where i live and most households have at least one member of the family who has been made redundant (some even more) i wish for a better and stronger economy in 2011. Joining you in your Christmas wishes. The last few years have indeed been difficult for so many people! Have a wonderful and blessed year in 2011!! !